You are here: Percolated.co.uk » Guides » What’s the best way to store coffee beans? Coffee is part of many people’s routine. For most, it’s just and grab-and-go habit to get through a weekday morning, for others, it’s a pleasure without compare. Those who enjoy brewing a proper cup of coffee at home know it’s not as easy as it seems. Each type of coffee, roast level and brewing method produce a different beverage altogether. Let’s not be that dramatic. Let’s just say coffee is food, and like food, it has a life span. Extending that life is key to your success. To store coffee adequately, you must only make sure you keep the four enemies of coffee at bay: Oxygen, moisture, heat and light. Oxygen makes coffee beans stale, it leaches aromas and flavor as it oxidises the precious oils in the beans. Moisture can make your coffee beans mushy, eventually rotting the poor fellas. Heat and light speed up oxidation and steal freshness. Understanding these four threats is all you need to practice some common sense and keep your coffee in mint condition. The ideal place to store coffee is a cool, dark place; not too humid, not too dry. A good cupboard away from the stove, a radiator or a window is best. Transfer your beans from its bag to an airtight container if it’s opaque even better. 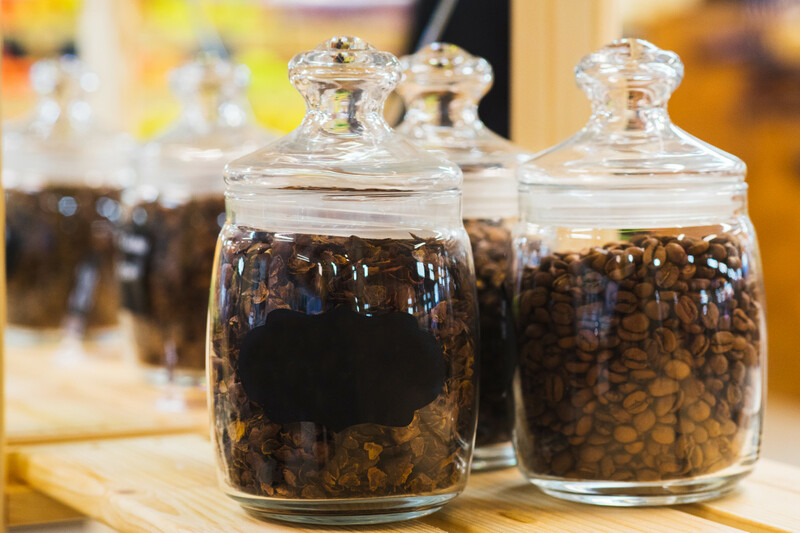 Don’t store your beans in cardboard bins or paper bags as they will add unwanted flavors to your brew, instead use food-grade plastic, glass, ceramic or non-reacting metal. Remember, whole beans will keep longer than pre-ground coffee, and lighter roasts are more resistant than the frail, darker beans. What about the fridge? Sure, it’s cold and dark, but it’s very humid too. Coffee can capture the scents of things around it, so letting it sit beside a chunk of onion or left-over pizza might not be a good idea. More often than not, you’ll end up finding these impurities in your morning brew. Nor the fridge or the freezer are optimal places to keep coffee. Think about all the condensation and frost involved. Nothing, not even coffee, tastes as good as it’s never-frozen, always-fresh version. Last but not least, the information on the label will ultimately determine how you store your coffee. Quality coffee will have a roasting date printed somewhere in the back. This determines the lifespan of your coffee. This is sad to hear, but heavy roasts like Espresso, French or Italian, are best consumed within a few days from the roasting date. Lighter roasts, like the Cinnamon Roast or New England roast, will keep for a few weeks. To address this issue, buy coffee at a local rotisserie and avoid big supermarkets. Buy small batches of freshly roasted beans that you’ll know will be consumed short after. If you’re really committed, consider roasting your beans at home. No one said it would be easy; is it worth it? It is for us, what about you?